Medical Gas Testing & Certification: meets requirements of NFPA, JCAHO, USP, & CGA. ESP is a PIPE (Piping Industry Progress & Education) certified medical gas inspector. Certification of Isolation & Reverse Isolation Rooms: ae/h, negative pressure, HEPA challenge, etc. Respirator Fit Testing to comply with the new OSHA respiratory protection standard. 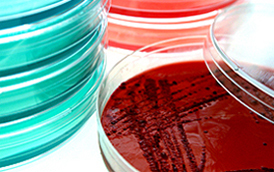 Legionella & Pathogen Water Testing to satisfy the new JCAHO requirements. Electrical Safety Compliance Inspections: meets testing requirements of OSHA and NEC. Includes safety testing of branch circuits and all AC electrical equipment. Hood Certification & Repair: all makes and models of fume hoods, bio-safety cabinets and laminar flow clean benches. Member: IAFCA (International Air Filtration Certifier's Association) & IAFCA certified by proctored examination. Hood and/or room decontamination using either portable Chlorine Dioxide technology or the standard Paraformaldehyde method. 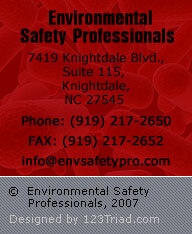 On-site Air Sampling Services: formaldehyde, xylene, toluene, & other lab agents. Testing includes ventilation evaluation & comprehensive review of safety program. Same-day written report. Mock OSHA Inspections: reduce costs incurred due to OSHA citations or workman's comp claims. Includes comprehensive safety manual custom tailored for your facility. OSHA 501 certified field inspectors. Respirator Fit Testing: meets OSHA & NIOSH requirements & recommendations for annual fit test. Passive Diffusion Monitors: badges available to inexpensively monitor employee breathing zones for over 40 compounds. Call for a complete list. Hood Certification & Repair: Authorized service for all makes & models of chemotherapy & IV hoods. USP <797> Particle counts, CAD drawings of buffer zones/areas, audit of current conditions for compliance to USP <797> and airborne microbial testing service. Passive Diffusion Monitors: badges available for ethylene oxide & glutaraldehyde. Waste Anesthetic Gas Monitoring: includes leak detection, ventilation testing, & monitoring of ambient nitrous oxide, ethrane, forane, halothane, etc.